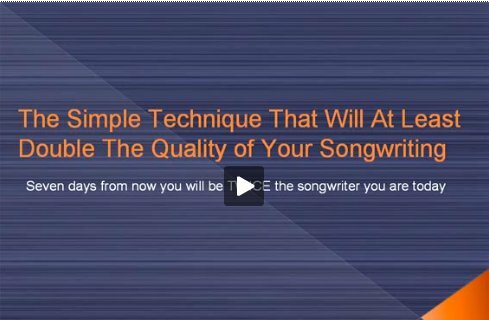 What I'm about to teach you now are six free songwriting tips you can make to your songwriting approach that will cause immediate improvements in your songwriting ability. Don't mistake the simplicity of these ideas for a solution that's "too easy". Because if you actually try these ideas, you will find they are incredibly powerful. Tweak number one is to record every second of your creative sessions. Now there are two important elements to this, so bare with me for a moment. The first element to this is to use a simple recording device to record yourself as you play your instrument. When you are searching for ideas, you need to document them, and recording every moment is the easiest way to do this.More importantly though, by recording every second you are eliminating a process that can savagely block your best creativity. The vast majority of musicians will be creating ideas with their instrument and also TRYING TO REMEMBER what they are playing at the same time. The problem with this is they are engaging the critical side of their mind, which blocks their creative facilities. The psychology behind this is quite fascinating, but instead of spending extra time going into it, just give this idea a shot and see for yourself as you suddenly become more creative! Set a recorder running, and then play freely without trying to edit yourself, or trying to remember what you are playing.It's amazing how freeing this can be, and creating becomes much more fun and effortless. As you are writing a page of lyrics, you are actually documenting them automatically because you are writing them on paper! But here's something you can do to increase your creativity and get into a "flow" really easily. Instead of internally editing yourself… (Have you ever sat there trying to craft the "perfect" phrase, and because of this don't end up writing a thing? )… write freely with no concern for the quality of what your writing. Write down EVERYTHING that comes to mind. Even if in the back of your mind you hear a voice saying, "that's absolute rubbish"! Writing down every idea that comes to you, just like with the sound recorder technique above gets your creative juices going. Instead of feeling "stuck", ideas will flow out of you.And you'll find that the longer you write, the better the quality of your ideas will be. If you've ever been in a "brainstorming session" you will understand what I mean. In a brainstorming session for a company or some other group, a team will sit around and say out loud or write on paper EVERY SINGLE IDEA that comes to mind. There is something magical about this process. Because as the team gets deeper and deeper into the session, they begin connecting with their more powerful creative resources and their ideas become more sophisticated, more insightful…… And in some cases, pure genius. If you've ever been involved in a session such as this, you will know that on most occasions the best ideas seem to always pop up right at the end of the session. It's the same with writing a page of lyrics. As long as you keep writing every thing that comes to mind onto your page, you can experience this same "building of creative momentum". And then all of a sudden something miraculous will pop into your head, and onto the page it goes! The key here is to write every single little thing. Don't edit yourself for a second. Instead of thinking "that idea isn't worth writing down", simply write it down anyway with the knowledge that it will bring you to something much more profound and inspiring.